I could fairly be accused of a little recent pessimism about the outlook for the Australian economy. Today, I want to point to a reason things might be better than I expect: the labour market is a better functioning market than has been the case in previous cycles. The long run decline in the Australian unemployment rate over the past few decades coincided with a decline in the proportion of employees that were involved in industrial disputes. 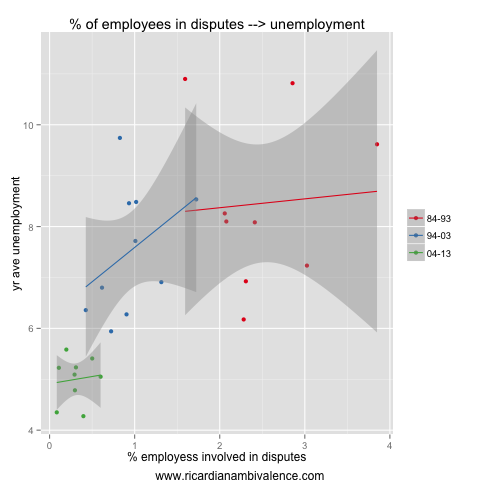 The micro- part of my eco-brain links the two: better labour market function leads to both lower unemployment and fewer disputes. Notwithstanding the regulatory changes five years ago, industrial disputes remain subdued as a proportion of the workforce. If this is a true signal that labour market function has improved, we have good reason to think that this adjustment will be smoother than has been the case in the past. This entry was posted in AUD, Australian Politics, economics and tagged Labour Market, Unemployment. Bookmark the permalink.